Early this morning as I sat here in New England with shoveled snow almost to the window sills, I came across an interesting article. It talked about the Danish practice of hygge (pronounced “HUE-gah”); which is their time-honored means of coping with long, cold, and dark winters. In Denmark their hours are marked by dreary and cloudy conditions 64% of the time and is never hot. As psychologists know well, long periods of cold and dark can lead to feelings of isolation and depression. Yet despite the odds being stacked against them by Mother Nature, the Danes somehow manage to rate themselves as being the happiest country in the world. How is this so? 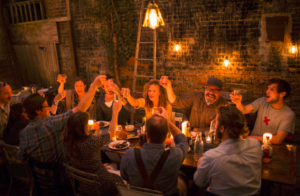 Well, many attribute this to their having a mindset of hygge which loosely translates to “connection, coziness, and fellowship”. It’s a practice of making simple, direct connections with other people…” finding joy in simple pleasures and communing with loved ones in a low-key, but meaningful way” …” it’s about simplicity and making a real, unpretentious connection with other people”. This leads, of course, to better (open/honest/more meaningful) communication that strengthens relationships and ultimately leads to more happiness. Reading this article made me think of a meeting I had last Friday about preparing for an upcoming customer meeting. The event involves inviting in a smaller group of local customers to have direct, simple, and frank discussions with my team, the Data Center Science Center, for the purposes of learning from each other. We plan to discuss upcoming technologies, best practices, and the challenges our customers are experiencing right now. Just like the practice of hygge, we want this to be informal (no PowerPoints) and unpretentious (no “dog and pony” product pitches). Conducting the meeting in this way will ensure it’s a valuable experience for both sides. The Science Center is part of the Office of the CTO at Schneider Electric. We research technologies and trends to develop best practices for how to plan, design, build, operate, and maintain data centers. We freely share our research through product-agnostic white papers and early planning TradeOff Tools. Having regular, direct communications with our customers is VITAL to our team’s success as thought leaders. It better enables us to provide solutions and clarity to complex data center infrastructure issues and challenges. It would be easy to just sit back in our corporate offices reading blogs, industry news sites, and talking only to ourselves and our own lines of business. But we think the reality is, you have to be out there in the field…in real data centers…having frank, two-way conversations with partners and end customers to gain genuine insight and understanding that leads to useful and practical innovation. So I encourage you to participate with us. Feel free to email us at DCSC@schneider-electric.com if you’d like to have a general discussion about data center physical infrastructure technologies or your next data center planning project. Our tools and research should help you clarify design tradeoffs and simplify choices. It should lead to happy times for both of us. Spring, after all, is just around the corner!